Dimensions: 25.5" x 11.5" x 21"
California Air Tools is a young company based in 2002. However, the company has already become popular among many customers. It has been manufacturing innovative air tools of a high quality and durability. The company focused its production mostly on oil-free and ultra quiet air compressors. 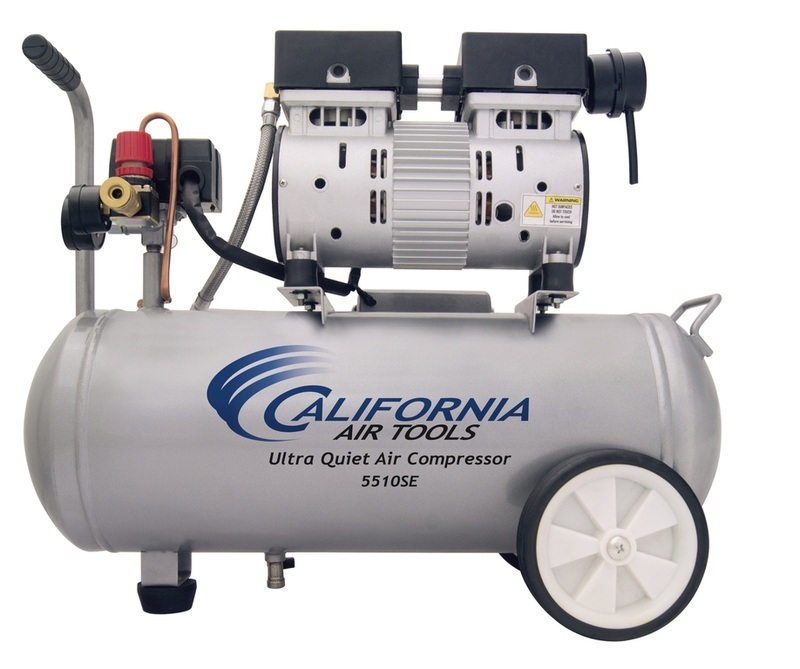 The California Air Tools 5510SE compressor is included in the Ultra Quiet Series of Air Compressors. Let’s point out main features of the Ultra Quiet Compressors line and the 5510SE model in particular. The Ultra Quiet Air Compressors are efficient, powerful, and reliable. Moreover, California Air Tools capitalized on the technology that provides the longevity of the motors. 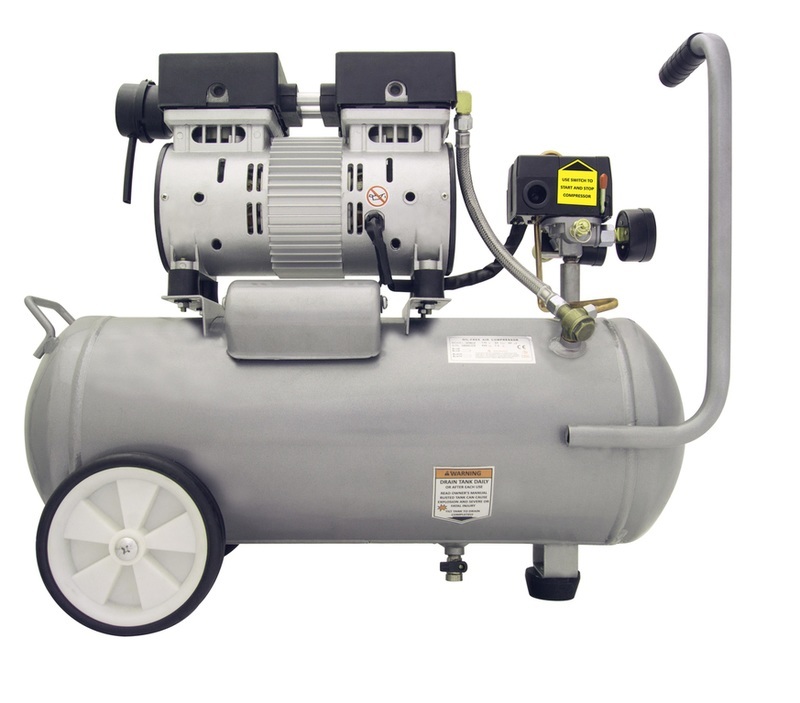 Each item is fitted with the oil-free dual piston pump system that improves work of the compressor. Due to this system, the device creates less noise and can perform for 3000 hours. Additionally, Ultra Quiet Compressors provide more airflow and faster coverage in comparison to a single piston pump system machines. And finally, motors and pumps of the Ultra Quiet compressors are easily repairable. If you are looking for a compressor for airbrush painting, the 5510SE air compressor is worth mentioning. It’s an oilless compressor which means that it doesn’t require to change, dispose or refill oil. Besides, you can use the item even at low temperatures. The CAT 5510SE model is suitable for a variety of applications like airbrushing, cleaning, or inflating. Beyond that, you can apply with the compressor such power tools as engravers, nail finishers, dental drills, or blowguns. You don’t have to scream while speaking to any person when the device is operating. The item comes with a large storage tank that keeps the pressure level at a given range. The tank includes two pressure gauges and one universal connector. The compressor pressure regulator switch automatically turns the machine off when the pressure is 115-120 PSI. The motor will restart at 85-90 PSI. The California Air Tools 5510SE has two carrying handles for easy transportation. Moreover, two wheels make it possible to roll the item while traveling. So, it’s convenient for those who need to move from one place to another. In the Owner’s Manual, you will find all the necessary information regarding the parts of the compressor package. More than that, there are rules, instructions, and warnings about the assembly and correct operation of the compressor. 25.5" x 21" x 11.5"